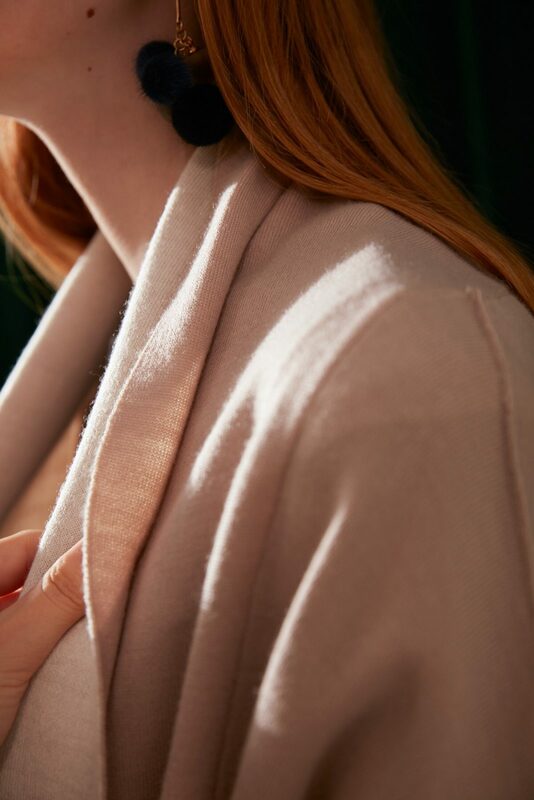 Simple and elegant, this relaxed fit cardigan offers effortless contemporary style. Two tone construction adds dimension and visual interest; long vertical seams create an elongated silhouette; two hidden side pockets add functionality without bulk. Each garment is impeccably crafted with a premium 50% wool 50% acrylic blend. The last time I wore this, it started a conversation about how people usually think of comfortable and put-together as mutually exclusive, but this cardigan blurs those lines. 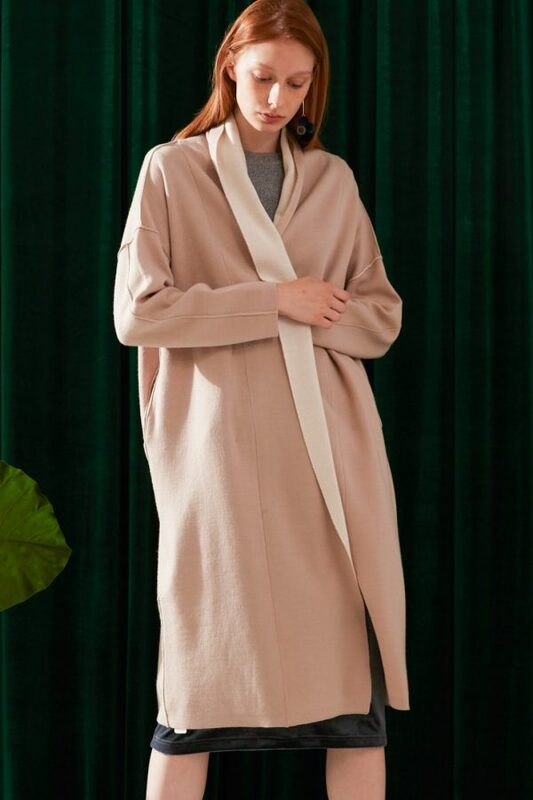 I was worried that the oversized fit would overwhelm my small frame but the delicate neckline and drape of the cardigan made it fit my body well. And kudos for having real, functional pockets! I don’t usually wear gloves so they provide a sanctuary for my cold hands. Great piece that’s turned into a wardrobe staple. I love this cardigan! Although I would say the color is more beige than pink unlike what the monitor showed. Not really warm enough for December in New York but I’ll be wearing it come Spring. Can’t wait! LOVE this cardigan! So comfy and chic!! I just received this cardigan and I LOVE it! Right now it’s a bit too chilly in DC to wear this as the sole outerwear but I do layer it underneath my long puffer coat and take off the puffer when I am indoors. The material isn’t scratchy like low quality wool knits. The wait wasn’t too bad either, I think it took a week and a half before I got mine. I got SO MANY COMPLIMENTS! Everyone asks where I got it from and I almost don’t want to tell them. So glad I got it!! I love this cardigan, it looks really pretty in person and I get asked where I bought it every time I wear it. However, I do wish that they would keep it in stock instead of having people wait 2-3 weeks. It’s probably one of the most worn pieces in my closet and I’m not even normally a cardigan person. The fabric is soft and the color is light beige with pink undertones. I think it would look great against most skin tones. This is a gorgeous cardigan, but unfortunately it is a bit too long for my 5’2″ frame. Exchanged it for the wrap top and high waisted pants which are fantastic.